Plump chicken breasts and legs are marinated before being broiled, then baked in the oven, resulting in chicken that’s moist, tender and flavorful. You know, recently I’ve been thinking how my mom used to broil chicken – and how delicious it was. And I’ve also been thinking how no one seems to use their broiler for cooking anymore…. 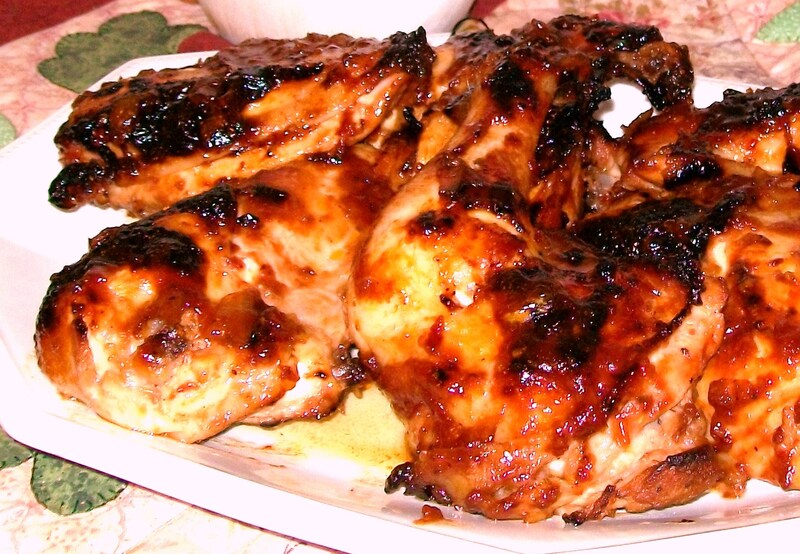 So, drag out that broiler pan and cook yourself up some of this oven-barbecued chicken. It’s yummy! ++ Don’t have a broiler pan – use a large baking pan and put a cooling rack in it. ++ Don’t have either a broiler pan or a roasting pan – that’s OK. Use a 13″ x 9″ pan. The Oven-Barbecued Chicken will be delicious which ever type pan you use. In a small frying pan, cook 1/2 cup chopped onions for a few minutes. (They don’t need to be fully cooked.) In a bowl large enough to fit six pieces of chicken, put the cooked onions, Italian salad dressing and barbecue sauce – mix everything together. Add the six pieces of chicken and turn to coat. Cover the bowl and refrigerate for several hours – or overnight – turning the chicken at least once. About an hour before you plan to eat, remove chicken from the barbecue sauce mixture. DON’T THROW OUT THE SAUCE!! SECOND STEP – – Broiler on LOW Pan placed on highest rack in oven. Turn off broiler. Remove chicken and broiler pan from oven. Place oven rack in the center of the oven and set temperature at 350 F.
++ Place broiler pan – with the broiled chicken – in the oven. Bake chicken for about 25 minutes – or (using a meat thermometer) cook until chicken reaches an internal temperature of 170 F.
++ If you happen to have a broiler pan, I recommend using it ’cause the chicken will be less crowded and will cook faster. Enjoy!! Next Post A Small Fan of My Yellow Farmhouse – Who’s a Big Fan of Sheperd’s Pie! Did you bake it in a casserole dish with sauce on it or is there a better way? You bring up a very good question Amber. Yes, you can put the broiled chicken in the oven in casserole, or keep it ‘as is’ on the broiler pan and bake it that way. Thanks for your question. I often do ‘updates’ when I change something in a recipe – or realize that my directions weren’t as clear as I had hoped. So, I’m going to do an ‘update’ right now! That’s great – you’ll enjoy it! I was at Susie’s last night and made it there. We really enjoyed it. My original idea was to just “broil” the chicken for 15 mins. a side, as my mother used to do. BUT… today’s chicken breasts are HUGE and they weren’t cooked enough after 15 mins. a side… So Susie said, “What about putting it in the oven?” And that’s what we did – it was perfect! !